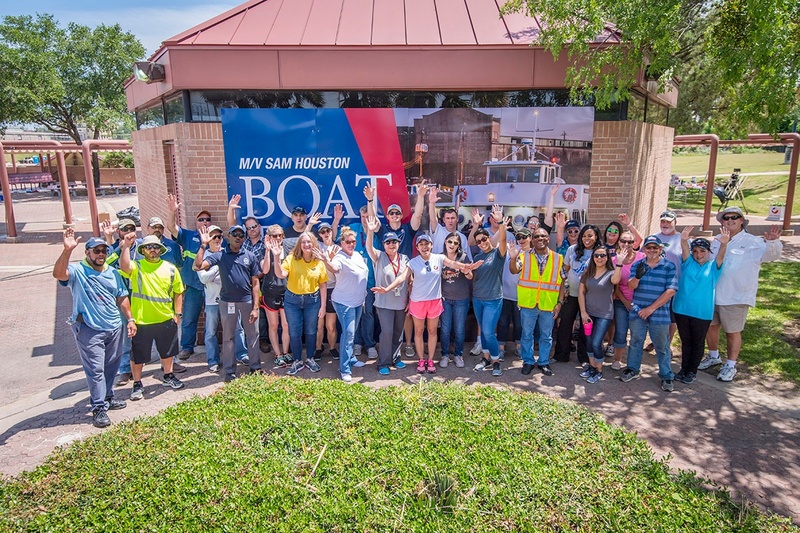 Each year, the M/V Sam Houston Boat Tour brings nearly 30,000 visitors to Port Houston for a free, educational trip along the Houston Ship Channel. These visitors embark and disembark for their tours from the Sam Houston Landing area at the Port Houston Turning Basin. While the port continues to work on long-term plans for the pavilion area, port employees stepped up to enhance the area, making it more welcoming to the community. More than 50 port employees volunteered their time participating in outdoor beautification projects. Some Port Houston team members filled new planters with flowers, while others sanded and painted benches, weeded or trimmed trees. Additionally, two art projects were completed that will bring more color and character to the space. New signs were also installed during the event and light-pole banners will be added to the area along the water early this summer. “Everyone who visits the port for a tour on the M/V Sam Houston deserves to have a welcoming and memorable experience. This event allowed our Port Houston employees the opportunity to take part in projects which ensure that kind of experience for all of our guests,” said Leslie Herbst, director of community relations and events for Port Houston. Port Houston also recently entered into an interlocal agreement with the University of Houston Gerald D. Hines College of Architecture and Design, to design and construct an open-air shade structure at the Sam Houston Landing. The Graduate Design/Build Studio students will gain hands-on experience and Sam Houston tour visitors will benefit as well. For more information about the Sam Houston Boat Tour, please visit: http://porthouston.com/sam-houston-boat-tour/.